And Pappu calls others dictators and “emperor without clothes”. 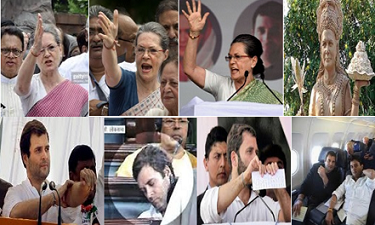 Look at the hand gestures of Sonia. Anger, frustration and extreme contempt. Only an extreme Narc would allow herself to be sculpted to a “fake Goddess” or have jerks issuing full page ads falling at her feet. As for the little ignoramus; his biggest animation is rolling up his sleeves in all his silly speeches, like he’s up for a street fight. Other times he tears manifestos and slams ordinances by a PM from his own party. Pretending to care about farmers or the poor, this little brat lives in the lap of luxury and practically does no work. RG utters such extreme nonsense that any parent would be ashamed if s/he had produced an empty-brain like him. Yet, the Congis are so enslaved that they cling to this family, unable to escape slavery. What exactly do these goons mean by “untoward incidents”? Clearly, a threat of violence and rioting. None of this happens without the approval of the dictators of the party – Sonia and Rahul. Be it rioting and violence in Mandsaur or butchering a cow in public in Kerala. All of it happens with the knowledge and approval of the Gandhis. Congis don’t have guts even to take a bathroom-break in the middle of a meeting without a sanction from these dictators. So, like the Fiberal media and Sickulars like Commie-Congis, freedom flows only one way – For them to abuse, defend their crimes and hurl the vilest epithets at Modi or RSS or anyone not in their basket. From Nehru, right down to this little Pappu, everyone in this clan has been a naked dictator. It’s only now that people are asking them to wear some clothes. The audacity of claiming that their crimes must be hidden from the public simply because it will hurt Congis or the Chinese Gandhis is the kind of Hitlerism that has infested the Nehru-Gandhi clan for long. You talk about a play or movie about Nathuram Godse, the Congis will be the first to ban it or burn down theatres. These folks still think Indians are a bunch of fools who cannot tell the grain from the chaff. A Malayali author is being threatened with his life if he didn’t convert to Islam. Another teacher in Kerala (TJ Joseph) had his hand chopped because he asked some question about Islam. In Bollywood, Sanjay Leela Bhansali’s freedom to concoct stories about Rani Padmini is ferociously defended. Trashing Hindu Gods and Goddesses in Bollywood and in other arts is promoted as artistic expression. But talk about crimes of the Gandhis – their goons are sent to riot all over the place. 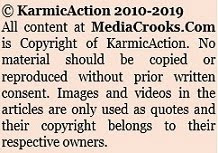 Even the horrible 66A was enacted because of Facebook posts that trashed Sonia and Rahul. Such is their intolerance of any dissent or even cartoons. The story of Emergency maybe about Indira and Sanjay and maybe partly fictional. But that’s the freedom artists have. Every true story world over is always introduced as “Based on a true story” or “Inspired by real events”. All such movies are dramatized to some extent, otherwise it would be as bland as the clueless Gandhis. 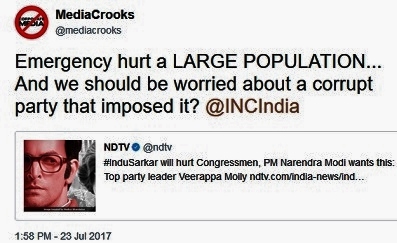 Indu Sarkar would be best judged by those saw the Emergency close-up and experienced its cruelties or observed those. “Control, it's all about control. Every dictatorship has one obsession and that's it. In ancient Rome, they gave the people bread and circuses. They kept population busy with entertainment but other dictatorships used other strategies to control ideas, the knowledge... how do they do that? Lower education, they limit culture, censor information, they censor any means of individual expression and is important to remember this, that this is a pattern, that repeats itself throughout history”. Exactly what the Nehru-Gandhi clan has done with Indians. Kept them poor, largely uneducated and threw them crumbs as doles. They made every effort to destroy Hindu culture and promote the Chrislamist ideology. They curbed free speech, imposed Emergency, brought in 66A and the discriminatory RTE. SoniaG has been president of Congress for 19 years (since 1998). RG has been general secretary and then VP for the last four years. And they talk democracy? These power-hugging dictators are the ones standing naked in front of Indians. We don’t need lessons from them on democracy or any kind of freedom. And because the pattern will not change, these naked dictators must perish from the political landscape or at least buy some real clothes. Raviji, factual and hard hitting, as usual! But Indians are loving watching the Chinese Gandhis being stripped naked daily and yet prancing like the well dressed pope! Indians are waiting to see these trecherous anti nationals in Tihar with all the slaves of the Khangress party, or whatever is left of it! Patriotic, honest and hard working Indians who love their motherland contributed in whatever way they could to strip these crooks "nekkid" BUT the one who did it best was the REAL Hindu Hriday Samrat Guruji @swamy39 and he will ensure the Chinese Gandhis go to Tihar or to the cell where Veer Savarkar was jailed by the British. Guruji is the TRUE Bharat Ratna, not the 3 Nehru Gandhis who bestowed the BR on themselves like "NAKED DICTATORS"! Raviji, "Carry on Stripping"! This is a democracy where an illiterate Rabri ruled 10 CR public.A foreign lady with dubious past ruled India through proxy.Hundreds of celebs,politicians, journos bow before her n her moron son.Still she controls the oldest pol party as a dictator.Still her son says Modi as naked emperor.Rabinar has rightly exposed the family. Oh My God! U r par excellent! I mean, your write ups. Wish you could get them translated into other indian languages. Simply superb. Still a group of blind faithfuls stall parliament on behalf of these C.Gandhies. Nakedness attracts or what.?? Most dangerous from this fanatical Catholic duo is rapid spread of Xianity,by breaking Hindus.In Karnataka Lingayats are encouraged to declare themselves non-Hindus by Siddu their henchman.In fact politics is secondary destruction of Hindu society is primary target.Innermost circle of Sonia is all Catholic.Where does this Rahul go at govt expense to mysterious places?Some Catholic conclave?No difference between Mother Teresa and Sonia both want destruction Hindu society for Xianity to take over.Jihadis not haf as dangerous. Mr. Manoj. Your comments reflect you abject mental slavery. Shame on you and your mind. Defending the indefensible crimes of the mental retard mulatto and her lowly bar-maid, you are a colonised mind. You sound like a typical Congress Pappu. The protests against Bhansali movie was by the Rajasthani community and other such communities. 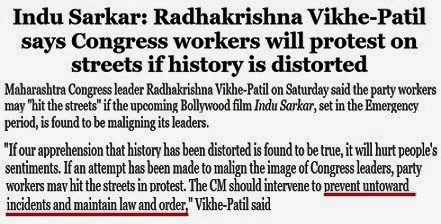 The agitation and threats issued against Indu Sarkar is directly by a mainstream political party which wrongly calls itself now as a "national" party. Are you so dumb that you cannot see the difference? Please don't forget the filthy corrupt crowd surrounding GHANDHI RULERS want these dim witted GHANDHIS so that they can get a free hand in looting people,alter our history books,play with hindu civilization,divide hindus as dalits, shikhs &jains.They got support to convert hindus to Christians &islam.Ghandhis chose ministers from muslims chritians,and jaichands of hindus.If there was no RSS they would have wiped out copletley hindu ethos religion &way of life. Top class, accurate & crisp article describing fake gandhis.. Sooner India finishes them off politically, faster our nation will achieve prosperity. 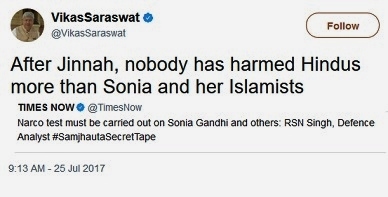 If only BJP showed the guts to throw this woman in prison for the crimes she's committed, many Indians would start believing more that our democracy prosecutes criminal politicians as well, unfortunately we are yet to witness a day where these fake gandhi's end up in jail for their loot..
We Indians are suckers. Even though we know exactly what these corrupt Chinese Gandhis are made of, still if Modi Sarkar makes a mistake of putting them in jail, they will come back strongly on sympathy votes. Their only punishment should be slow and painful humiliation through election defeat after election defeat. Yes, that is dilema. Corrupt Lalu's party and Jaya's shashikala can rule from jail and old, ugly uncle and grand pa actors accepted as heros. It is after 70 years may be some of us are figuring out the dichotomy of our situations and finding our mojo. It's fate that make these leaders, atleast let us resolve to keep them(Chinese Gandhi) out of power for rest of their wretched lives. 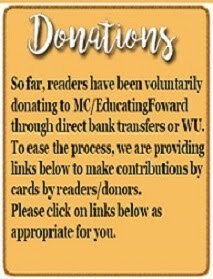 Being cut and shut off from their major domestic as well as foreign supplies and sources, their robotic and zombie-like moves and maneuvers belie their contentions and betray their intentions. Fidgeting and flitting, but never quitting; mumbling, rumbling, fumbling and tumbling, but never crumbling; such apparitions of those persons, though defeated and unseated, are always conceited; though defused and confused, are always suffused, with anger and revenge; although keep wondering and wandering, don't ever consider surrendering; their past dark experiences and previous daring exploits keep them afloat on lightest support, aroused to faintest opportunity, and upbeat about any slightest letup in misery. So, as we all can see, "the situation is tense, but under control"! Thanks, if your reply is directed towards my comment, and I'm not mistaken. It is not Chrislamism. It is "CommiChrIslamism" & Commichrislamists that Sonia promoted and unleashed to destroy Hinduism. Exactly what the Nehru-Gandhi clan has done with Indians. Kept them poor, largely uneducated and threw them crumbs as doles.This sentence to be written in BOLD and UNDERLINED.